A total of 4,51,602 candidates took the examination at 2,137 centres in 59 cities. Over 4.5 lakh students on Sunday appeared in civil services preliminary examination which passed off incident-free at various centres across the country after bring mired in controversy following protests over change in pattern. As many as 4,51,602 candidates took the examination, about 1.27 lakh more than the last year, at 2,137 centres in 59 cities. “There were no incidents of protest from any of the centre in the country. We are very happy that the examination went off peacefully and without any law and order problem,” Union Public Service Commission Secretary Ashim Khurana informed. He said none of the chief secretary of states, where the examination was conducted, reported any incident of protest. “All officials of UPSC, Department of Personnel and Training and chief secretaries successfully coordinated for peaceful conduct of the examination,” he said. A total of 9,44,926 candidates applied for the examination and of these, 6,80,455 downloaded their admit cards for appearing in the test. “As many as 4,51,602 candidates took the examination in various exam centres spread across the country. About 1.27 lakh more than the last year,” Khurana said. A total of 3,24, 101 had appeared in civil services preliminary examination 2013. The UPSC had this time chosen 14 new cities including Varanasi, Noida, Ghaziabad, Gurgaon, Gwalior and Jabalpur for conducting the exams. 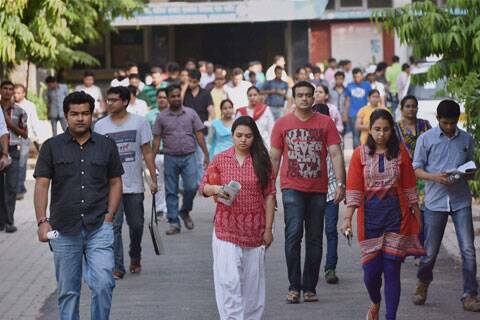 In Delhi alone, there were 222 examination centres. “As many as 66,787 candidates appeared for the examination from Delhi,” said Khurana, a 1983 batch IAS officer of Gujarat cadre. The preliminary examination consists of two papers–Paper I and Paper II of two hours duration each. The first paper began at 9:30 AM and second started at 2:30 PM. Some of the students complained of “errors” in Hindi translation of questions asked in English in Paper I. Both the government and UPSC officials did not comment on the issue. A controversy had recently erupted over the pattern of examination as students demanding change in Civil Services Aptitude Test (CSAT) or Paper II, had taken to the streets in a violent agitation, claiming it put aspirants from rural areas or Hindi background at a disadvantage. In the wake of such protests, Minister of State for Personnel, Public Grievances and Pension Jitendra Singh had on August 4 said in Parliament that marks of the English section questions, asked in Paper II, will not be included for gradation or merit in civil services exam. The DoPT and UPSC had issued separate instructions not to attempt questions of English language comprehension skills asked in Paper II of the examination as their marks will not be included in the gradation or deciding on merit. The Paper II carries questions on comprehension, interpersonal skills including communication skills, logical reasoning and analytical ability, decision-making and problem- solving, general mental ability, basic numeracy and English language comprehension skills (of Class X level). However, a group of students said they will continue with the protest. “We are against the pattern of civil services examination. We want a change in its pattern,” said Sampoornanda, who is part of a students’ movement ‘Nagrik Adhikaar Manch’. The prestigious civil services examination is conducted in three stages–preliminary, main and interview– by the UPSC to select IAS, IFS and IPS officers among others. Hearing an eleventh-hour petition filed by a group of protesting students, the Supreme Court had yesterday declined to postpone today’s preliminary examination.